Our stud type industrial leveling pads serve cabinetry, shelving, machinery and more. 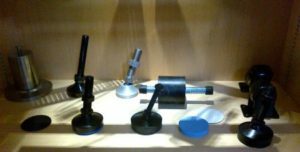 They are strictly engineered and manufactured to high standards, our industrial leveling pads can be used in every industrial product which come in several materials including plastic, stainless steel, steel and Zinc. Standard product design within application and R&D training enables us to provide solutions for even the most extreme problems connected with all the industrial fields. We are also able to fabricate to customer detailed specification needs.